Defined by its unique spine and vibrant color patterns this larger of the Angelfish makes a great addition to any large reef tank. Its sharply defined spine is shared by many of the pomachanthidae genus and distinguishes them from other large tank fish such as Butterflyfish. The Koran Angelfish can reach up to 14 inches and goes through dramatic visual changes as it grows from a juvenile. The white stripes on its body become stretched, curved and elongated resembling something similar to Arabic script, thus leading to its name “Koran”. They are also commonly referred to as Half-circle Angelfish and Semicircle Angelfish. Koran’s are considered to be more hardy members of their family and can become accustomed more readily than other types. This is especially true of the younger or smaller fish–it is best to introduce them to a new tank as sub-adults. A great deal of evidence supports the “Goldilocks effect” when it comes to Koran’s. Too small, usually 2 inches and under, and they adapt poorly. Too large and older, they have a difficult time feeding in their new surroundings. It is best to get them right around 3-5 inches when adding to your tank. Of course, use caution when placing in the tank with other fish. The Koran can be territorial and show aggression toward others. They will chase and nip at other more docile species of fish that are of similar size such as Rabbitfish and Butterflyfish. If you plan to have two Angelfish in the same tank a large (180 gallon minimum) tank is best. A male, female combination is best (they are not known to breed in captivity) and try to find one with distinctively different patterns and colors. They tend to direct their aggressiveness the fish more similar to themselves. Angelfish are omnivores but should have a diet leaning toward more of the plant food for their well-being. They will dine well on algae, seaweed, spirulina, and Nori. This can be supplemented with more meaty proteins such as shrimp, clams, shellfish, and squid. 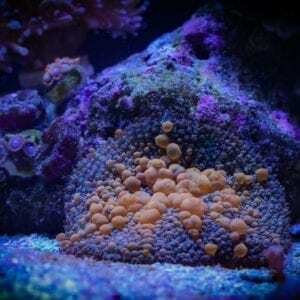 Although they must be monitored closely in a reef tank as they are known to eat sponges and pick at coral. As stated before, large tanks are best with a lot of unobstructed swimming room. Include many rocks and overhangs with good hiding spaces so the Koran Angelfish has a place to retreat to when frightened or tired. This always reduces the stress levels on the fish and allows them to live healthier lives. The best tank mates are Dwarf Angels, Wrasses, Damsel Fish, Clown Fish. They are particularly susceptible to diseases and infections as a result of poor water quality. Make sure to have a good filtration system and clean often.